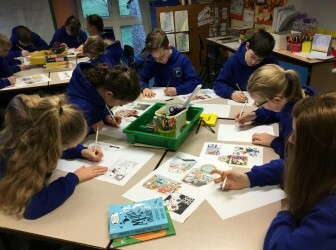 Today, the Excellent Eagles were visited by Dave Howarth - artist, cartoonist, designer - came into school to teach the children how to create cartoons of themselves. They were taught: how to draw emotions on faces; how to draw the movements of the body and how to use persepctive. They drew themselves in different activities at Robinwood Such as climbing, on the zip wire and giant swing. Eva said, ‘It was interesting because I’ve learned how to draw a person in a cartoony way’. Dave Howarth can be contacted through his website www.hmdesigners.com or through Facebook at Dave Howarth Artist.